Are there more wasps now or is it just me? Aug. 17…Please don’t sting me!!! 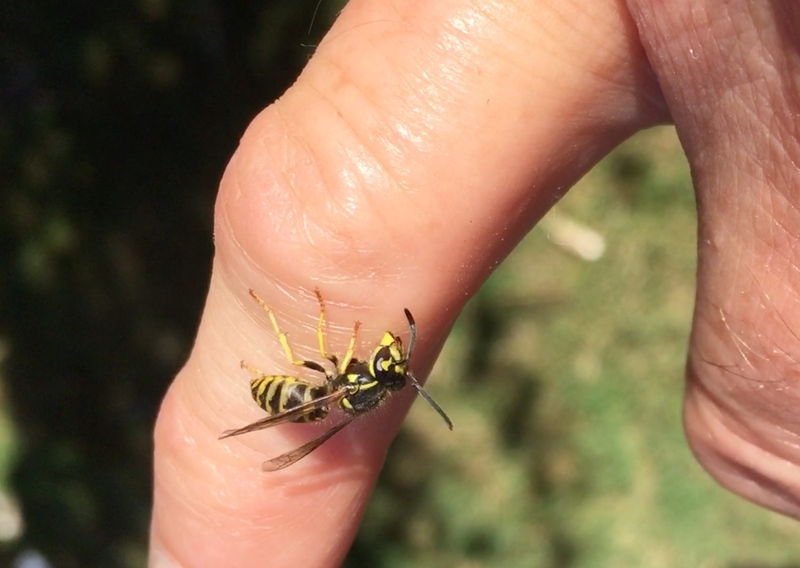 This wasp wouldn’t stop crawling on my fingers while I was trying to bury crab shell in the garden. That wasp didn’t sting me, but the one in my glove did. A little mud works wonders. I decided I’d better wear a bee suit to keep the wasps off me. Wasps are carnivores. Maybe they eat the soft parts of the crab remains, but they always gather around whenever I pop the lid open. Lately they’ve taken to crawling on me as well. August 16, I just got the largest single day load of crab shell ever. I can’t have wasps holding up the process. 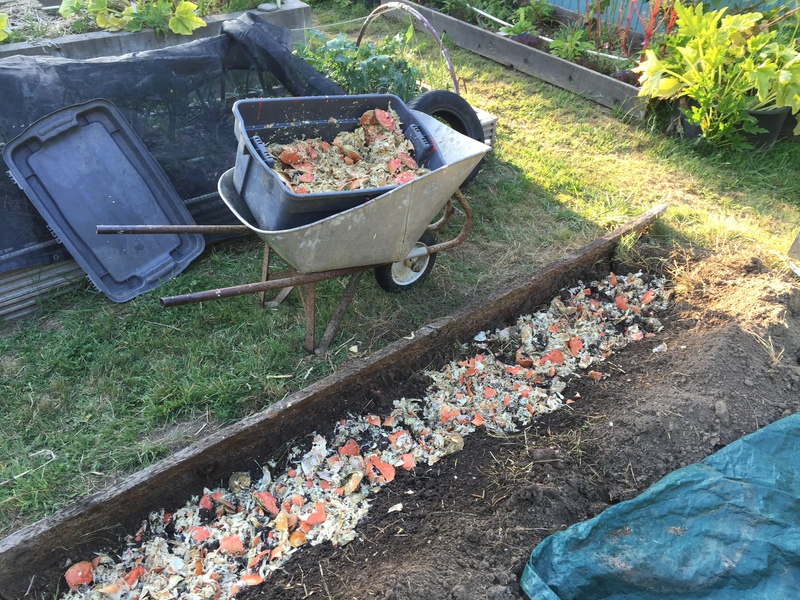 Bury the crab shell. Plant directly on it four days later. 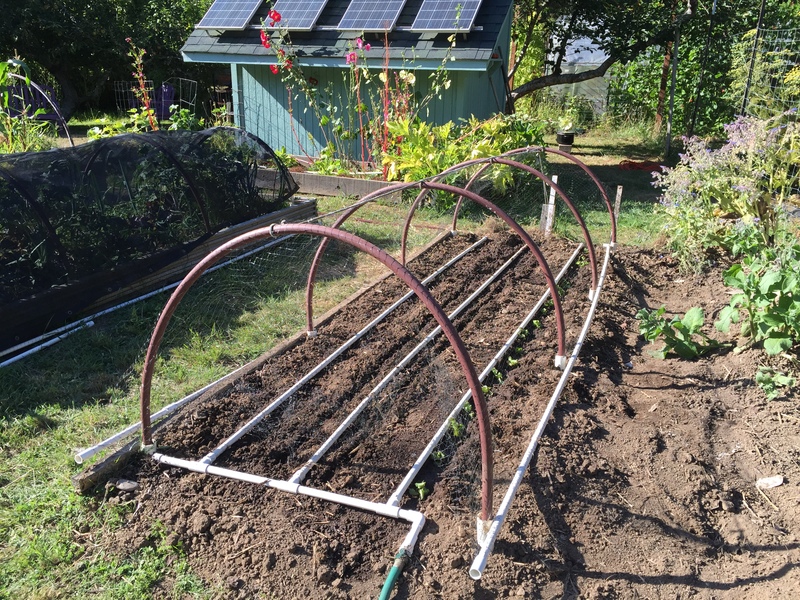 We will plant beets, winter lettuce, and more turnips on this batch. 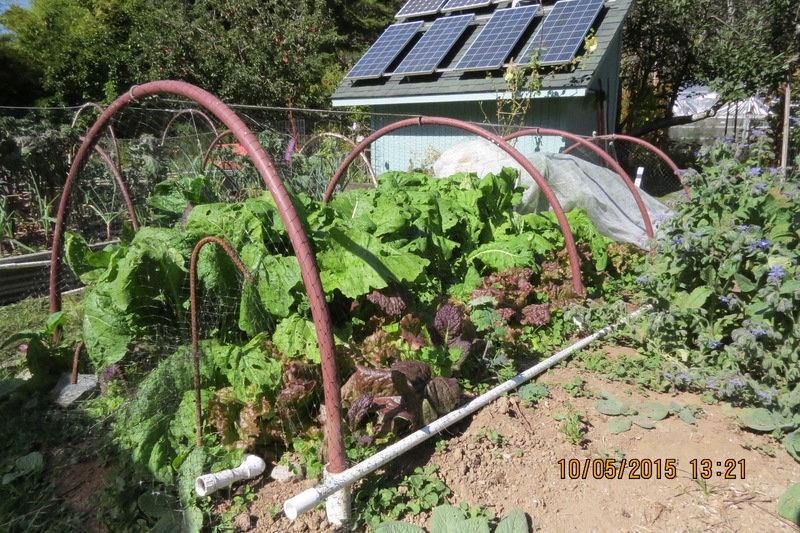 Oct. 5…Beets are already bigger than the ones we planted a month before. It must be the crab shell. 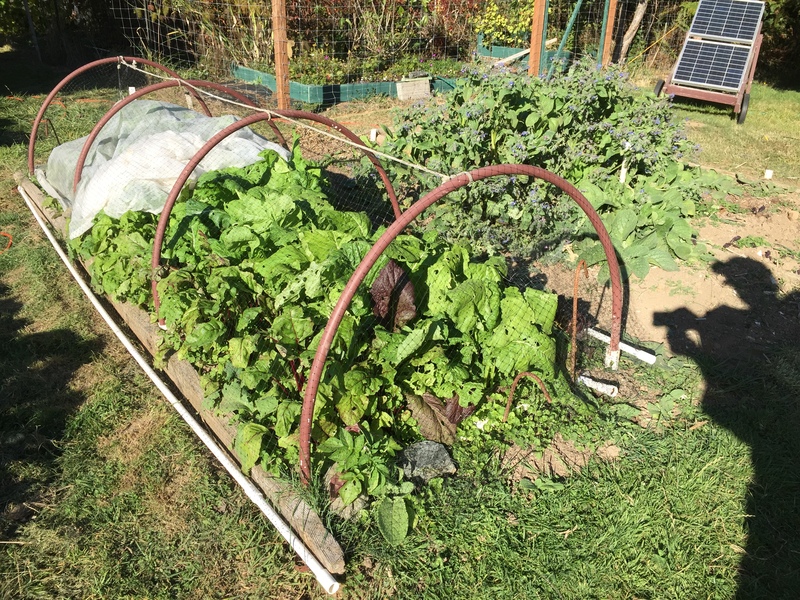 Oct. 6…Those turnips might be crowding out the lettuce, but we’re happy everything is growing so well. 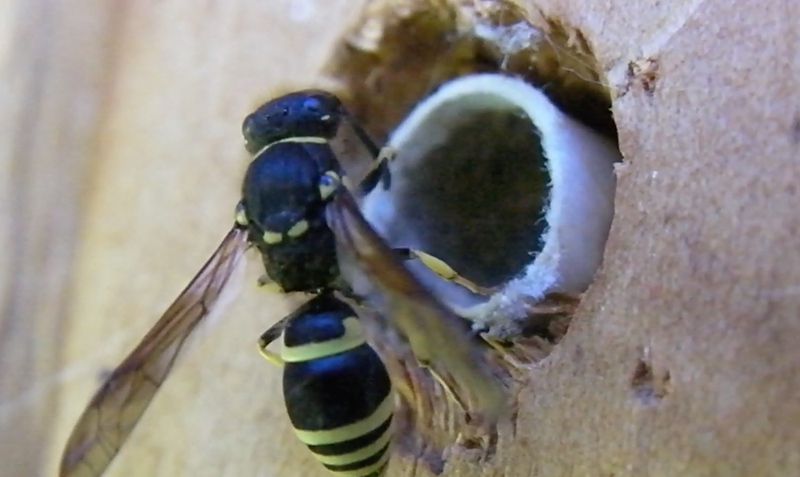 July 1…I spotted this Ancistocerus antilope wasp getting into my Mason bee tubes. I relocated them in the house immediately. I hope the wasp didn’t lay many eggs in any tubes before I moved it, or I’ll be hatching wasps in the back bedroom. 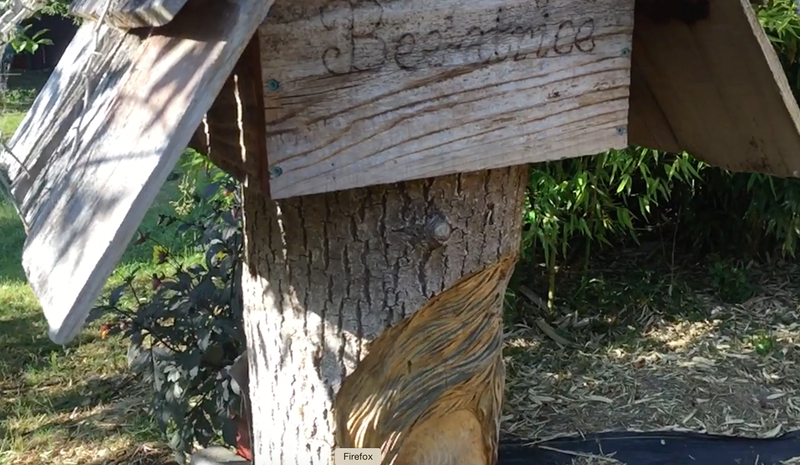 I shot some video on the Warre hive just to make sure what was going into the hive were wasps. Yes, there were some robber bees, but mostly wasps. August 7…The numbers of bees at the entrance of the hive has been lessening. Looking down at the pile of dead bees, I notice there are mostly drones, but there are also some dead wasps. 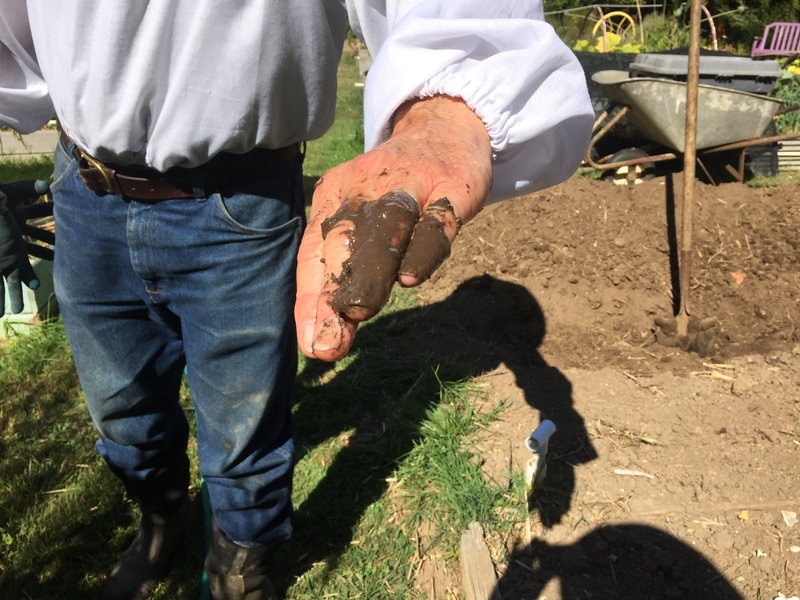 August 7…I picked up a couple of dead wasps from the pile in front of the Warre. Did the bees kill them? I doubt it. There were very few bees left. 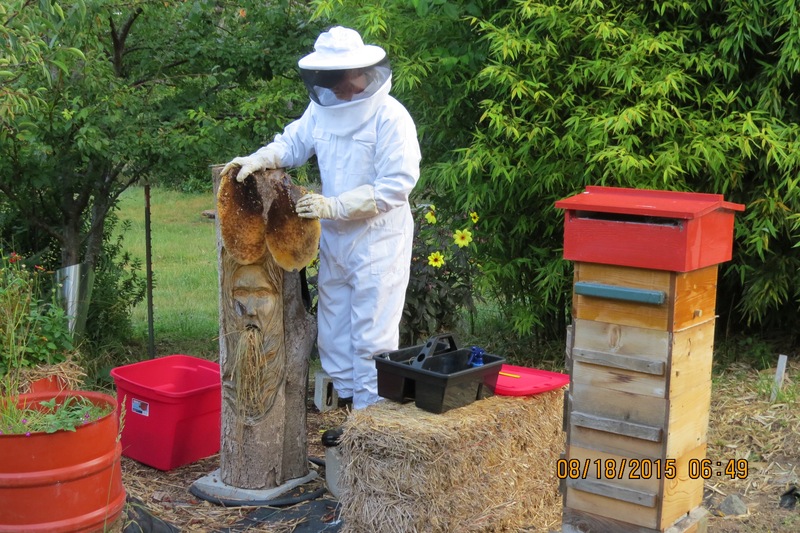 This hive (the one on the right) was real active back in June, and heavy with honey weight. What happened? Most of the comb was empty like this. No eggs, no larva, spotty drone cells. We might have had a laying worker. 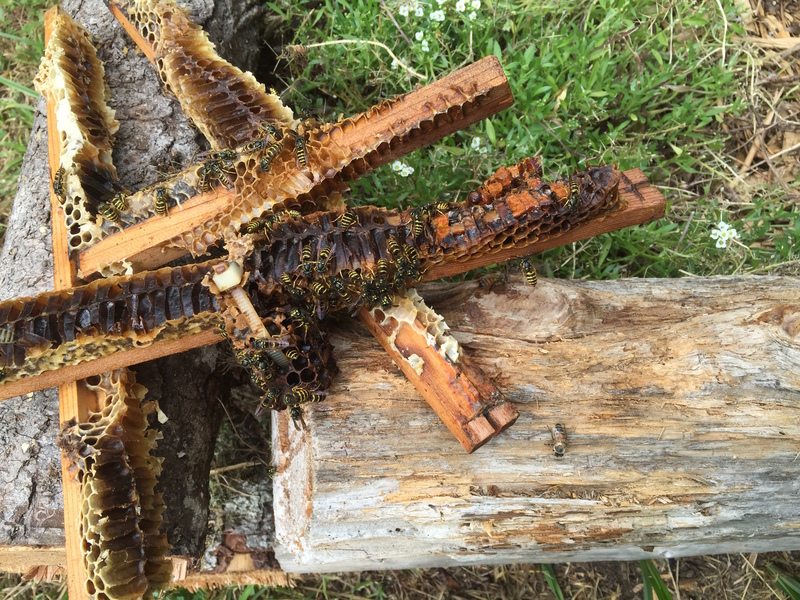 This is what the wasps were after…a comb or two of honey. 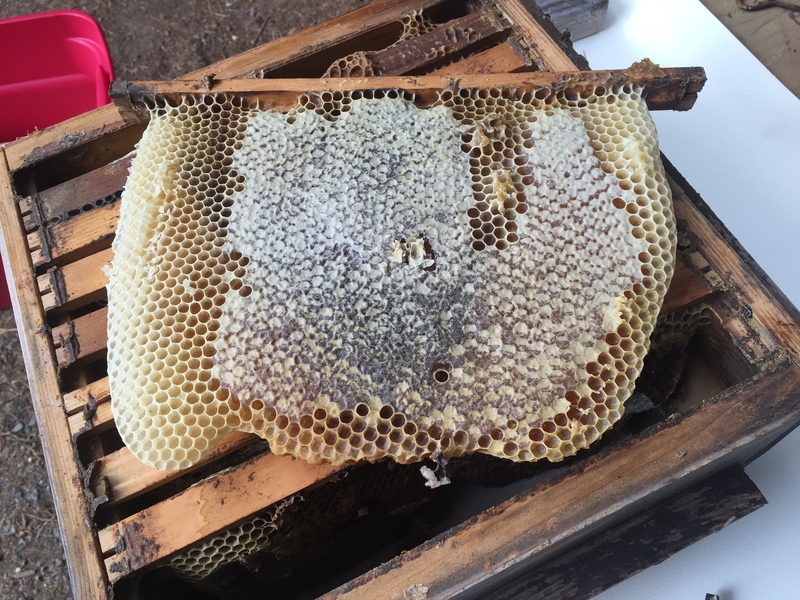 After removing most of the comb, I put these top bars out for the bees to clean them off, but where are the bees? These are all wasps! 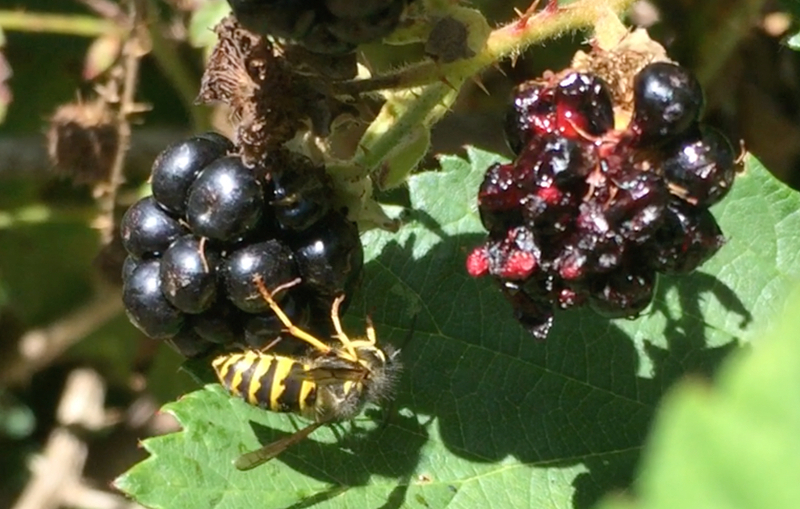 August 16…Wasps are in search of sugars. Here’s one on the blackberries. 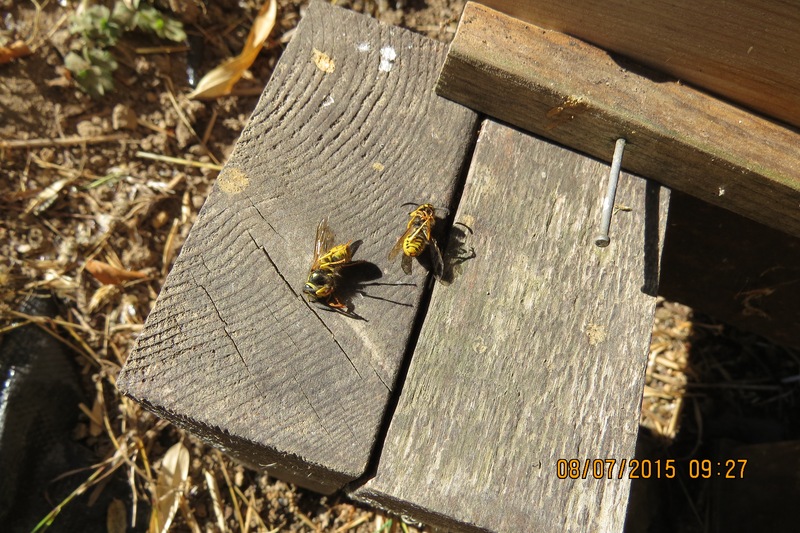 Sadly, Bee-atrice log hive is infested with wasps too. 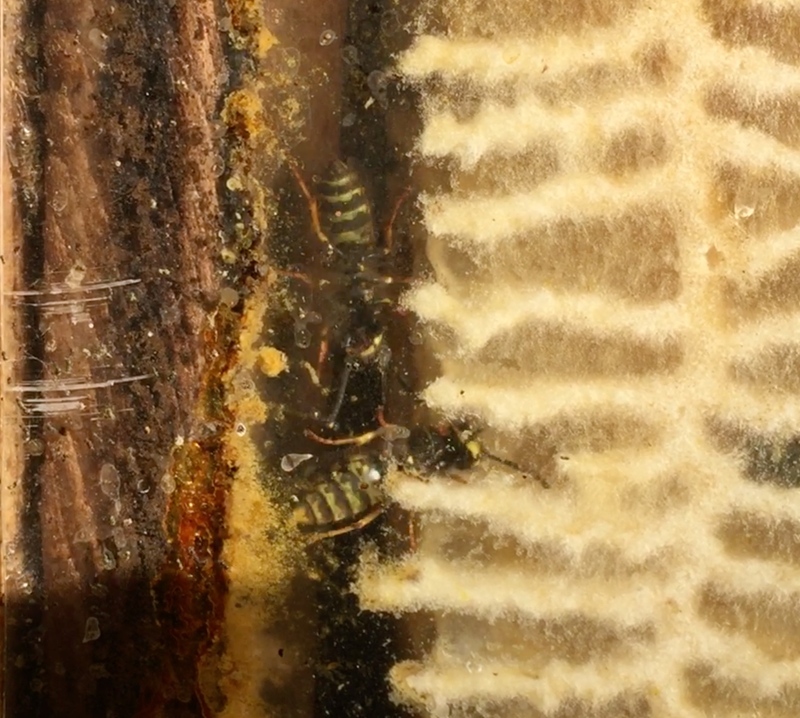 Bee-atrice log hive…Looking through the observation window, we see the final indignation…wasps are roaming at will inside. We must remove the comb. I won’t kill the wasps, but I don’t want to grow their numbers by feeding them honey. What’s the bee suit for? There aren’t any bees, but a bunch of wasps. The wasps didn’t attack me like the bees would have, but I had already been stung once as an accident. With that many wasps flying around, I wasn’t taking any chances. 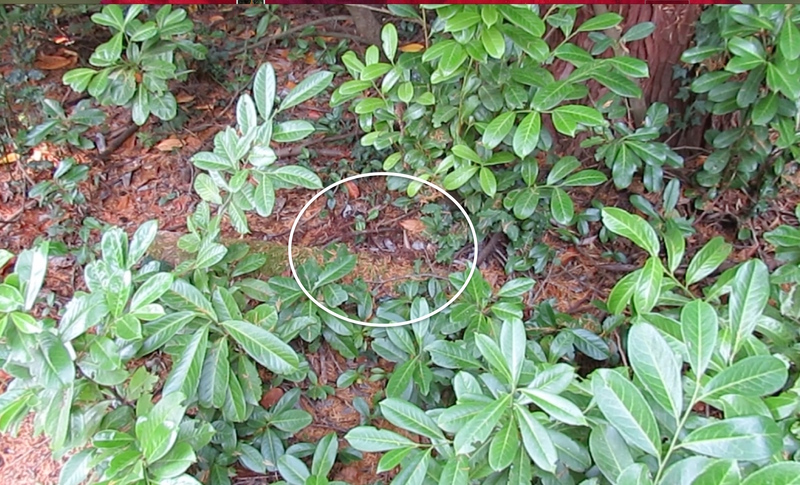 This is where the ground nest is, in the laurel hedge area. My wife discovered it when she was coaxing the cat out. Luckily, she only got stung once. In the video you can see how fast they move…at least twice as fast as a honeybee. July 8…We won’t be killing the wasp nest. Wasps are good for the garden. 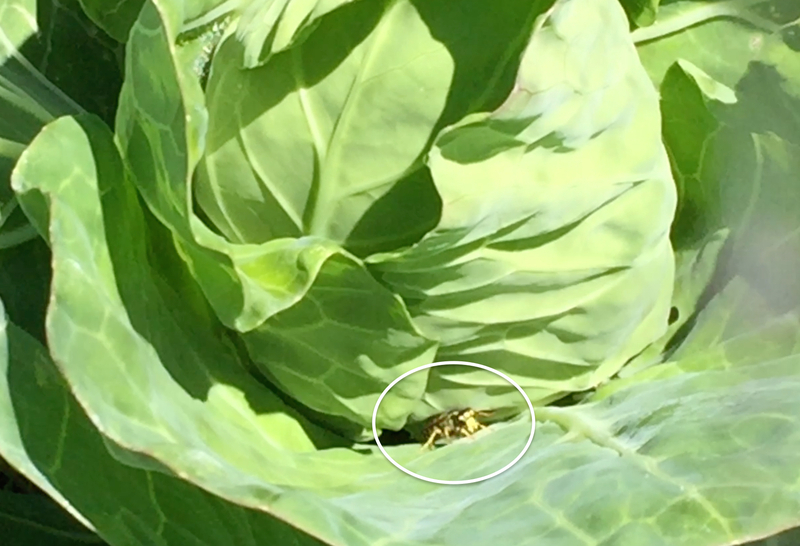 My wife spotted this wasp flying into the cabbage to rid us of the cabbage worm. We haven’t seen ANY this year. 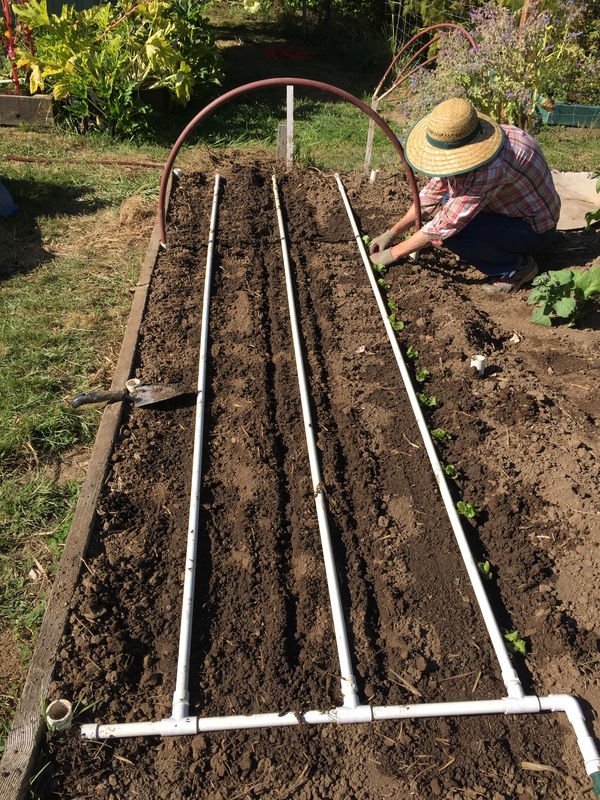 In years’ past, we would have to painstakingly pull little green worms off the seedlings. 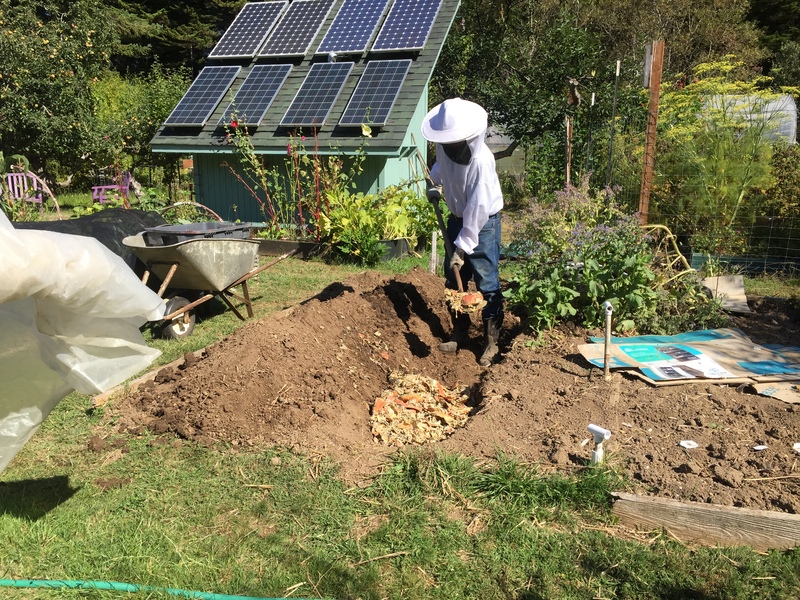 The wasps didn’t kill my bee hives…they just took advantage after the bees had died out. Are there more wasps now? We think so. 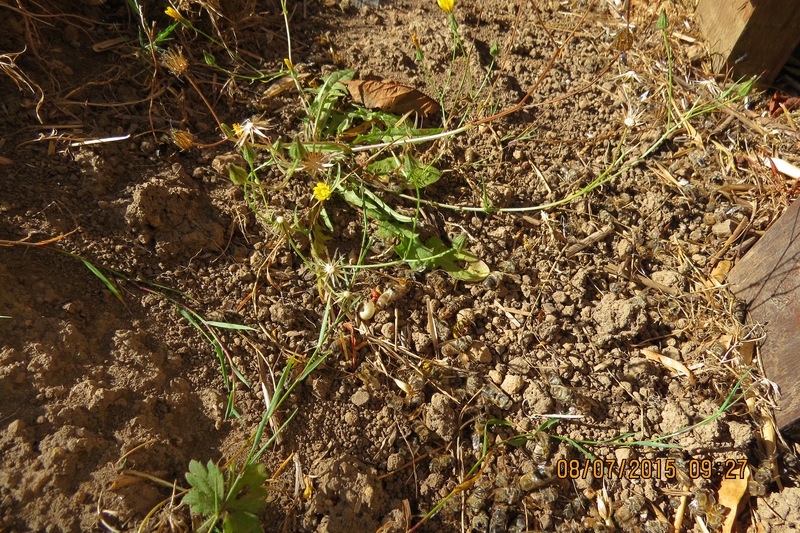 The winter was mild, we didn’t get as much rain as usual, and the wasps had an earlier start. It doesn’t look good Pat, will you have to look for new swarms? What did kill the bees? I’m always open for swarms. This year I gave two away and kept two. I’m happy not to have too many hives. What killed the bees? On the Warre hive I think the new queen didn’t make it back from the maiden flight and not having a queen pheromone present, a worker bee started laying. Workers can only lay drones which do no work. In the case of the log hive, it could have been CCD. We are close to the cranberry bogs and it’s no secret that they use neonicotinoids. You can hardly blame them as it’s much safer to apply than the old stuff and to my knowledge they don’t have to apply it as many times. That’s sad, sorry to hear that. If the colony lost the queen for some reason and then failed to make a new one perhaps they dwindled out. I wonder if varroa was also involved, it often is. Yes, I think that’s what happened in either the Warre hive and/or the log hive. They dwindled out for lack of a queen. I haven’t had mite problems in the Warre hive. Until I pulled out the bottom board, I had been checking it regularly. I might see a few mites, never more than a half dozen though. 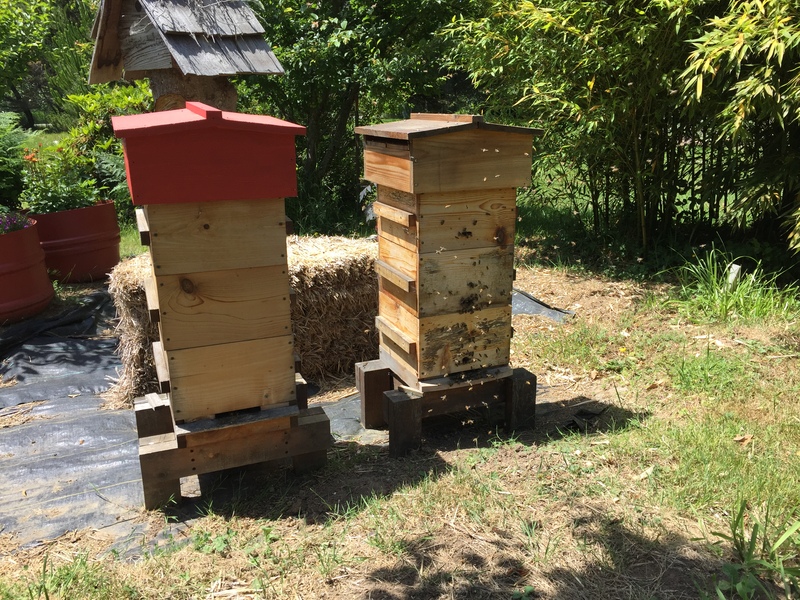 In the case of the log hive, I noticed by the thermometer, that the temperature has been 74˙F (23˙C) for a couple of months…not a good sign (no brood being tended after), and the numbers at the entrance had been lessening. Phew! Glad to see you didn’t destroy the wasp nest. I know they are a real pain around this time of year as their main source of sustenance has dried up. And I should count myself lucky that I don’t seem to have the problems with them that most have. But as you point out we should find some means of co-existence. As you can see from my most recent post, I am experimenting with giving them sugary treats, at least the ones that come into the conservatory while I am working…. Interesting to read about the wasp ridding the cabbages of creatures, that is good and never knew that. Here the wasp population (Ireland) does not seem to have increased at all. The last few years there are fewer of them around. I notice because I get bad reaction to stings, none the past few years. I would say I only saw about six this summer so far. No bees to speak of either, but so many bumblebees – in all sizes. I’m glad you get bumblebees. From everything I read, they are having a hard time adjusting to climate change and they play a key role in pollination. I’m puzzled why you have so few honeybees. I’m assuming you still have gorse there which I’m sure benefits bees in winter as it does here, so where are the bees? Yes plenty of gorse around here, in fact one of the most beautiful sight during the late winter months is the gorse along the sides of the roads here, if it is a good year, then the bright yellow is so striking. 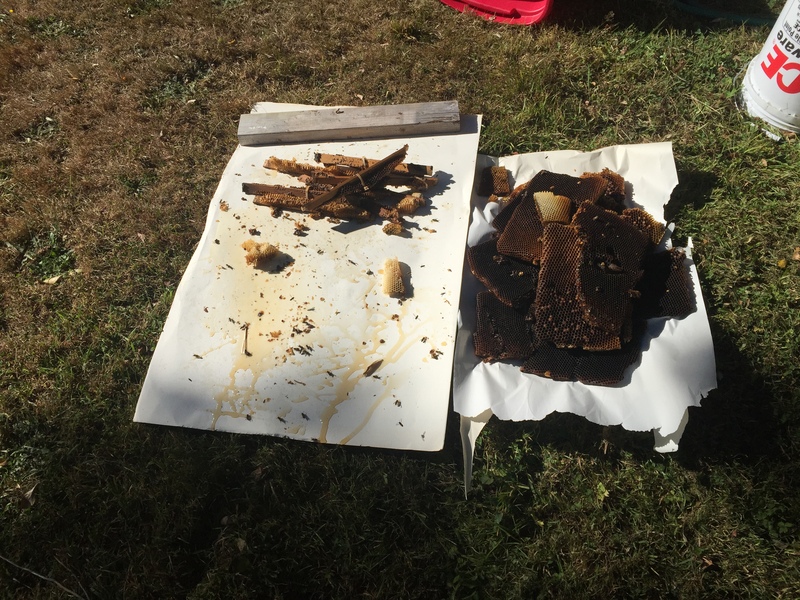 Here the bees have suffered a lot, beekeepers are not sure if it is due to the mite that kills them off (whole hives dying) or if it is due to pesticide use. But several beekeepers I know have had whole swarms dying on them. A sad story!